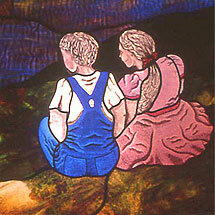 This window resides in the Wellsville Elementary School in Wellsville, Kansas. The rainbow and shooting stars were ideas the students suggested. This was a memorial window for a bus driver and two students who were killed in a school bus accident. The glasses are opalescent, and were manufactured by Kokomo Opalescent Glass Company. The children are out of German antique, and have the details and shading permanently fired onto the surface with stained glass paints. 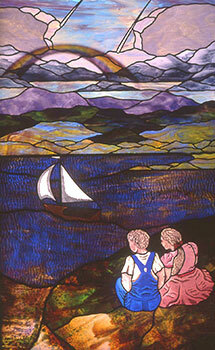 The glass in the lower section of the window, surrounding the children, was made by Chicago Art Glass. 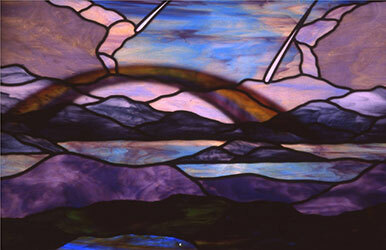 The rainbow is plated behind the clouds which gives a three dimensional effect. The glass is of German antique.